Being able to communicate with just the right individuals or groupings of people is at the centre of ChurchSuite's admin-facing system. 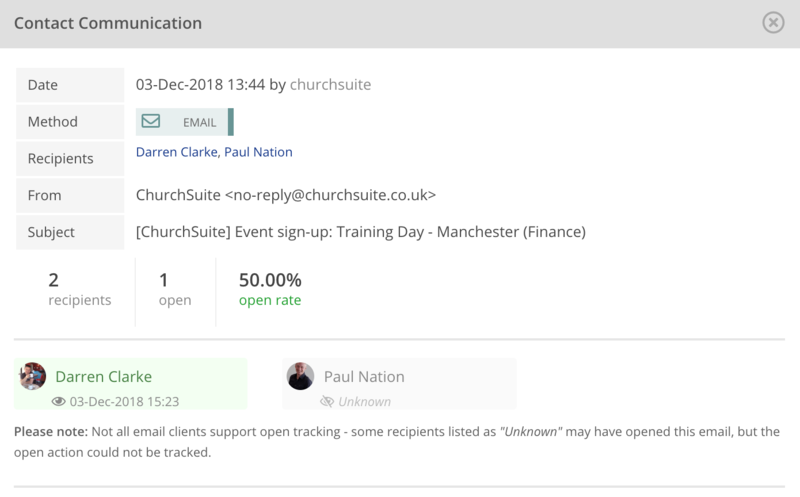 Throughout ChurchSuite you'll see a Communicate button at the top of pages and reports, enabling you to communicate with some or all of the people included on the page or report you're viewing. Most modules have a Communication section enabling you to communicate with individuals or groupings of people within the context of that module. For example, in the Children module you can select to communicate with either individual children, children in tags or children in groups (and/or their parents). Whereas in the Rotas module, you can select to communicate with members of "all ministries", "individual ministries", or those in particular teams and/or roles. Broadly speaking, all users are able to use the communication functionality within ChurchSuite for each module they have permissions for. Bulk communications sent through ChurchSuite are always sent "blind copied". When sending emails and SMS messages, ChurchSuite will always respect each respective recipient's "Receive general emails/SMS?" communication options by default. It's also possible to override communication options and send an email/SMS that disregards the "opted out" preferences of recipients - for example, where you have a compelling reason or lawful basis. When overriding communication options in this way, the user is required to enter an override reason that will be displayed in the footer of the email and therefore visible in your "sent" communications history. All emails (except confirmation emails) sent from within ChurchSuite include an "unsubscribe" link in the email footer, making it really easy for recipients to click to review their communication preferences and opt in or out of your various communication methods. Recipients can also manage their communication preferences in My ChurchSuite. See the related support article for information about customising the 'unsubscribe' experience of your church members. 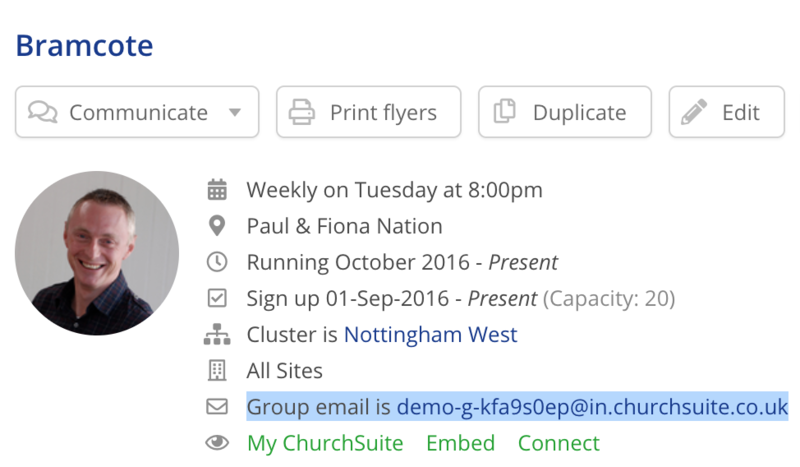 You can easily add file attachments to emails composed within ChurchSuite. 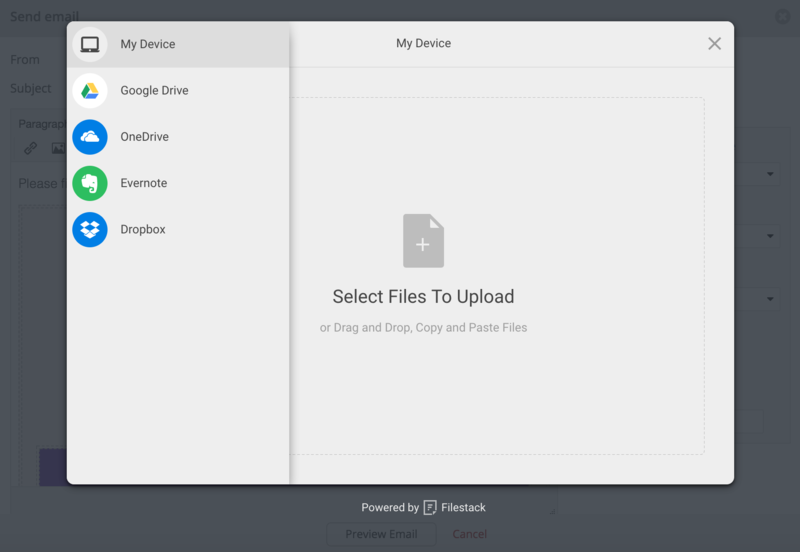 Attachments are uploaded using a third-party integration called Filestack, which enables you to upload multiple files from your computer or device, Google Drive, OneDrive, Evernote and DropBox. Important: Filestack keeps files uploaded from your computer/device for 24 months from the date of upload. This means that file attachments will no longer be available on emails older than two years. Attachments from Google Drive and Dropbox are not subject to this limitation and will remain active for as long as the files exist in your Google Drive or Dropbox storage. Does ChurchSuite include "chat" functionality? 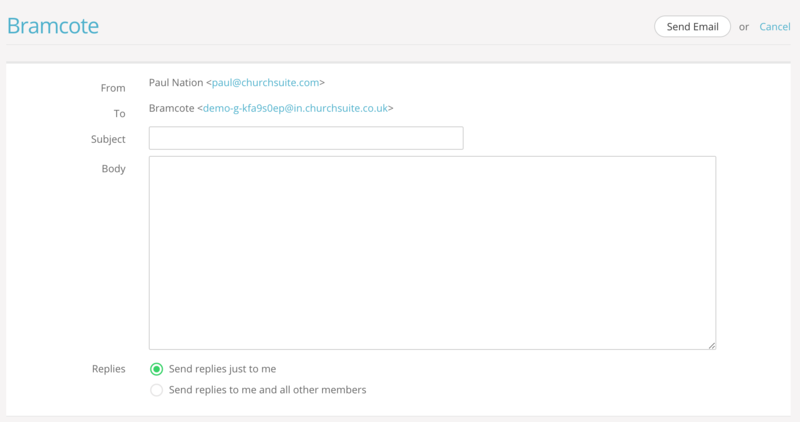 No, currently ChurchSuite doesn't include instant messaging/chat communication functionality within My ChurchSuite. Third-party "chat" apps, such as WhatsApp, do not currently permit third-party integration through their API. Since WhatsApp seems to be a preferred chat platform in many churches, use will need to be entirely separate from the ChurchSuite app, until such time as WhatsApp review their integration policy. When composing emails from within ChurchSuite, draft emails are saved locally to your computer rather than as part of your browser session, meaning you can safely log out of ChurchSuite and then log back in again and your email draft will be remembered - just as long as you continue to use the same computer/device. Therefore, when composing an email, the editor may pre-load with content from an email you were working on previously. If you want to start over and clear the previous content, you can do so simply by clicking on the New document icon, which will clear the email subject and body content, ready for you to compose a new email. When composing an email you'll have the option to select between different email formats. The default is Plain format - the email is sent in plain text, with the font family being rendered by the recipient's email application and the default font they have set there. 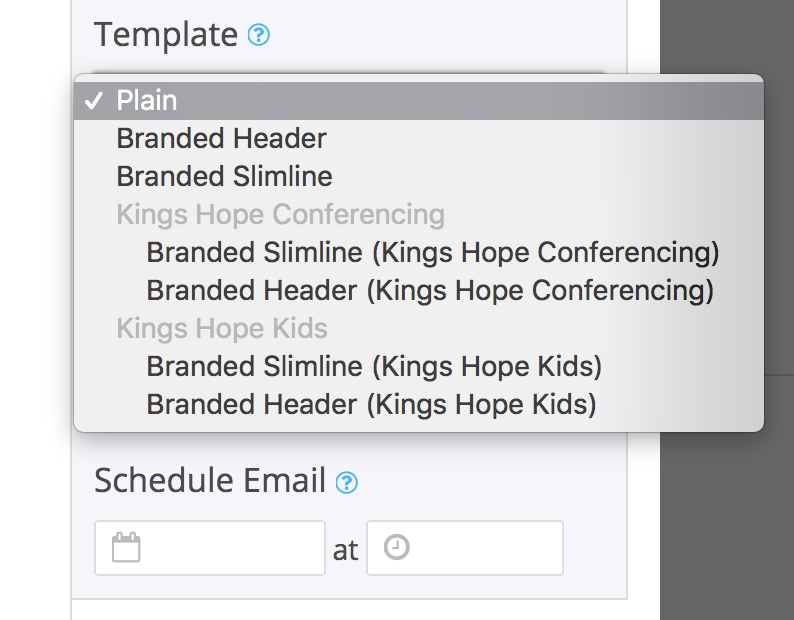 Beyond this are two branded types - Branded Header, which styles the email with your church logo at the top, applies your chosen colour styling throughout the body of the email and applies your chosen font family to all branded emails. The Branded Slimline format is similar, but doesn't have the logo at the top; instead a discreet church emblem logo is added at the end of the email. The colour styling and font family follow your church's chosen styling. You can review (and change) your church's colour styling, logo, emblem and branded email font family in Administrator > Profile. These settings are applied to all branded emails and cannot be changed by a user at the point of composing an email; although they can change the font size and formatting of body content if they wish. See the related support article on 'Personalising your ChurchSuite account' for more information about this. Before being able to communicate by SMS text message, you will need to complete an integration with one of the supported SMS providers for your region/country - either Textlocal, Bulk SMS or Twilio. See the related support articles at the end of this article. 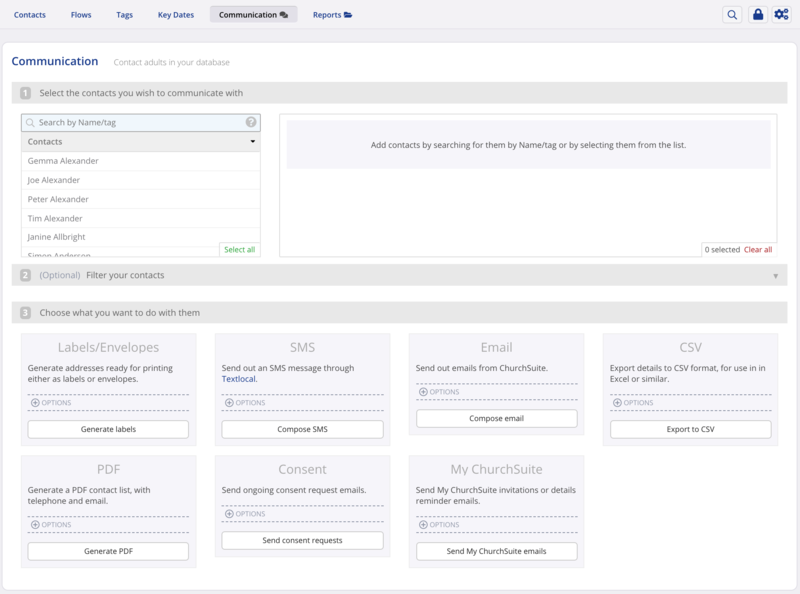 If you wish you can easily restrict the maximum reach of a single communication made by a user within ChurchSuite. In the Administrator area, simply select to "Edit user" and amend the "Restricted Communication" setting (located just under the user's email signature), either to a fixed amount or by percentage of total contacts within the Address Book. That same amount or % is then applied to communications sent from within any module i.e. it's all based on proportion of the Address Book. For example, setting a fixed value of 5 will limit all communication via SMS and email by that user to a maximum of 5 individuals. Setting a value of 0 (zero) will prevent any communications being sent by email or SMS. If a user attempts to send a communication in excess of that restriction they'll be prevented from sending and will be alerted to contact an Administrator for assistance. It's not possible (or intended) for Administrators to be able to override the restriction; instead they would need to change the user's restriction before the user could complete the send process, or another user with less restriction would need to send the communication. The related support article "Improving email delivery" explains how to complete the domain verification process for your church's email domain name. 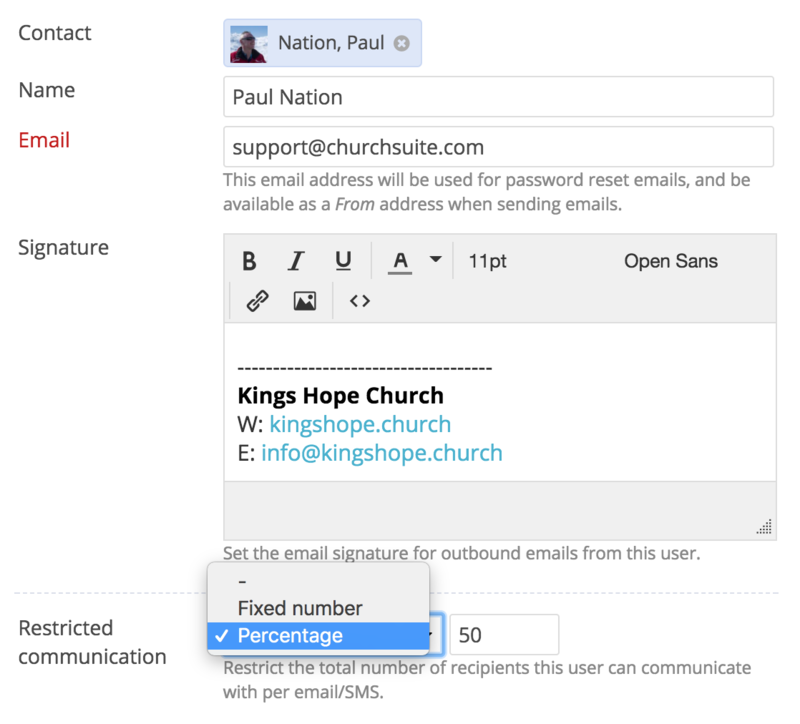 The verification process authorises your ChurchSuite account to be able to send your outbound emails using your church's email domain. Domain verification is increasingly becoming the industry standard for third-party systems like ChurchSuite to be first "authorised" in order to increase email security and deliverability, while also protecting your domain reputation from 'spoofing'. The process does require a little technical knowledge and involves adding two entries in the DNS settings for your domain. Note: Until your church's domain has been verified, all emails sent through your ChurchSuite account will show as being sent from subdomainname+user-username.out.churchsuite.org. Our out.churchsuite.org domain is a verified domain. The 'Reply to' email address will always show your user's correct email address so that replies are correctly routed back to the sender's email address. However, occasionally, some email hosts do not respect/support 'reply to', which could result in email replies not being delivered. Therefore, to ensure your emails are sent showing as coming from your church domain name email addresses we recommend you complete the Mandrill integration and have your domain verified. This only needs to be done once for each email domain used by your users (it doesn't need to be done for all users). Only owned domains (where you have management of the hosting, routing, and DNS settings) can be verified. Churches using public email addresses like Gmail, Hotmail, Yahoo etc. are not able to verify their email addresses as you cannot manage the DNS settings for the domains that host your email. This means that your emails will be sent using ChurchSuite's verified domain name as shown above. Churches may wish to explore acquiring their own domain name. This is generally inexpensive and easy to set up and use - doing so will allow you to benefit from domain verification to improve email deliverability; it will also add a more professional presentation of your church communications to your email recipients. While not an endorsement of their services, companies like GoDaddy and 123-Reg are used by many churches. In the remainder of this article we explore all of the ways a User might communicate from within each respective module in ChurchSuite. The Address Book module is the core repository for your adult contacts. Within the Address Book, menu options include Contacts, Flows, Tags, Key Dates, Communication and Reports. 1. From the Contacts menu, you can Communicate with any contact directly from their profile page - simply select to send an email or SMS. 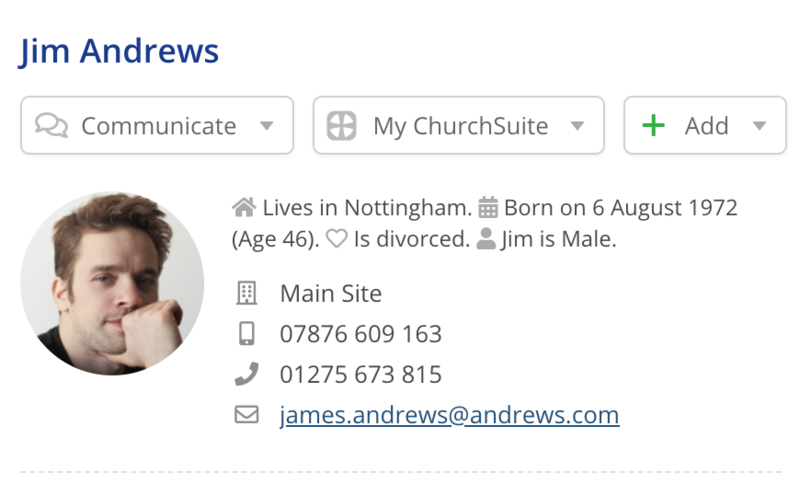 From the profile page you can also send individual My ChurchSuite emails directly to an Address Book contact - an invite or password reset. 2. You can communicate with contacts that have been assigned to a Flow. When viewing a Flow, notice the Communication button at the start of each Flow stage, enabling you to communicate with all contacts at a particular Flow stage. 3. You can communicate with all the contacts assigned to a particular Tag. Tags allow you to create custom groupings within your Address Book for groups that don't fit the group functionality provided in the Small Groups module or Ministry groups in the Rotas module - for example, you might group together all your leaders in a "Leader" Tag. To communicate with all contacts in a tag, navigate from the Tag menu in the Address Book, select a Tag, and then use the Communicate button menu at the top of the page. In this method, if an email address is shared by more than one contact (e.g. husband and wife), a duplicate email is sent to each contact. 4. As with Tags you can also communicate with all contacts that have a particular Key Date. From the Key Dates menu in the Address Book, select a Key Date and use the Communicate button menu at the top of the page. 5. In each of the above contexts, and from most Address Book reports, selecting Communication from a Communicate button menu will open the Address Book module's Communication utility page and populate it with all the contacts shown on the sending page or report. The Communication utility page (shown below) can also be used to custom-select one or more contacts to communicate with. 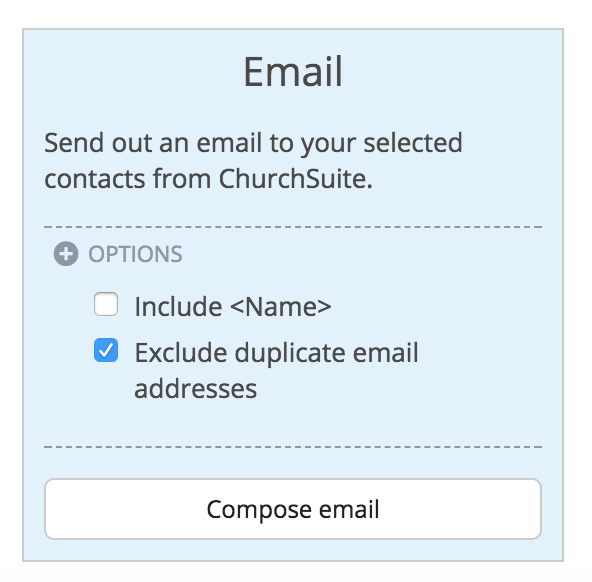 You can optionally filter your contacts further before selecting what you want to do with them - perhaps to produce Labels/Envelopes, send an Email or SMS, export to a CSV or PDF format file, or to bulk-send My ChurchSuite emails. When using the Communication utility, notice how you can select individual contacts from the list, or select all contacts - selected contacts move from the list on the left to the box on the right. Selected contacts can be removed. The Search by name/tag can be used to quickly locate contacts within large Address Books - click the ? in the search box to see a full list of short cut commands available - for example, to search by tag, type tag: and all your tags will be listed - selecting a tag will select all the contacts in that tag. Note also the drop-down selector to toggle between viewing a list of contacts and tags. In this way you can use the tick and cross tag options to match across multiple tags, matching "Any" or "All" selected tags - remember to click "Apply tags" to select the matching contacts in those tags. When sending emails using the Communication utility page, you have the option to exclude duplicate email addresses. For example, if a husband and wife share the same email address and both are included in the distribution, selecting the Exclude duplicate email addresses option will send only one email per email address, while still logging the sent email against both. 6. Many Address Book reports include a Communicate button menu. Where Address Book contacts are listed in the report results you'll have the option to communicate with the matching contacts being reported, or you can "push" the list of viewed contacts through to the Communication utility for further communication or export options. Note also that you can send the report being viewed by email to a recipient of your choice (the recipient must be in your Address Book). Sent communications are logged in the Recent Activity > Communication section at the end of each contact's profile page. Clicking "+More" will open the sent communication in preview, show details of other recipients included in the distribution, and show open rate tracking (emails only). The Communication report in the Address Book module reports (see below) provides a filterable report of all Address Book contact communications within a given date range, providing details of the User who sent the communication, the method, the date and time it was sent or scheduled. Clicking "+More" will open the sent communication in preview, show details of other recipients included in the distribution, and show open rate tracking (emails only). Within the Communication report only there is a "Forward email" option that allows you to re-send a previously sent email (perhaps to re-send to different recipients), and the option to cancel a scheduled email that has not yet been released from the queue. 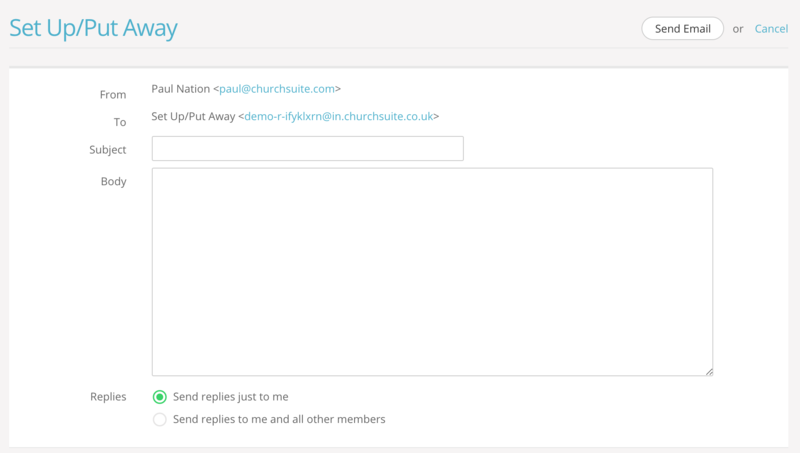 From time to time you might want to send out an email or SMS of a private nature, but still send it through ChurchSuite. Within the Communication report in the Address Book, Children and Giving modules is a Hide email action that allows you to hide an entry from the Recent Communication reports/sections so that your communication remains private. Once an email is hidden, it cannot be set visible again. The Children module is the core repository for your under 18s contacts. Within the Children module, menu options include Children, Attendance, Groups, Tags, Key Dates, Communication and Reports. Any time you communicate from within the Children module you have the option to choose whether to communicate with the child, the parent (which is either the linked/primary parent contact or the unlinked child's parent contact) or all parents (i.e. the linked partner/spouse of the primary parent in the Address Book). 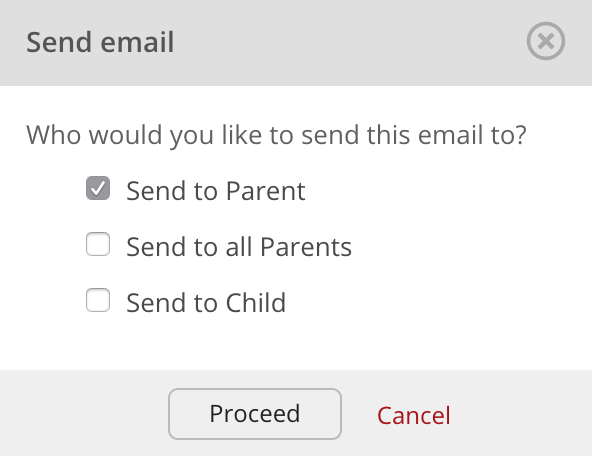 When Send to Parent is selected (see above), the person specified as Additional Contact is also contacted - Additional Email and Additional Mobile carries the same weighting as a primary parent. The Additional Email/Mobile fields are expected to be used where you have an additional person who needs to be copied in on all parent communication for the child. For example, an ex-partner partner who is not in ChurchSuite but has joint custody of a child, so therefore needs to be copied in on all parent communication at an equal level as the primary parent linked in ChurchSuite. In the example above, Amelia is linked to George as her primary parent and has Alan as an additional . "Send to Parent" will always send to both George and Alan, while "Send to all parents" will also send to any spouse/partner linked to George in the Address Book i.e. a secondary parent. 1. From the Children menu, you can Communicate with any child or their parent(s) directly from the child's profile page - simply select to send an email or SMS. 2. From the Attendance menu within the Children module you can communicate with all the children who attended a children group on a particular date. Search or navigate to the appropriate date and group and then use the Communicate button menu at the top of the attendance page. 3. From the Groups menu within the Children module you can communicate with all children that belong to a particular children's group in one of your gatherings. Select a gathering/group, then use the Communicate button menu at the top of the group's page. 4. You can communicate with all the children assigned to a particular Tag. Tags allow you to create custom groupings within your Children module for groupings that don't fit within the module's age-based groups functionality, or the groups provided in the Small Groups module or Ministry groups in the Rotas module. For example, you might group together all the children who came to your Summer Camp. To communicate with all contacts in a tag, navigate from the Tag menu in the Address Book, select a Tag, and then use the Communicate button menu at the top of the page. 5. As with Tags you can also communicate with all children that have a particular Key Date. From the Key Dates menu in the Children module, select a Key Date and use the Communicate button menu at the top of the page. 6. 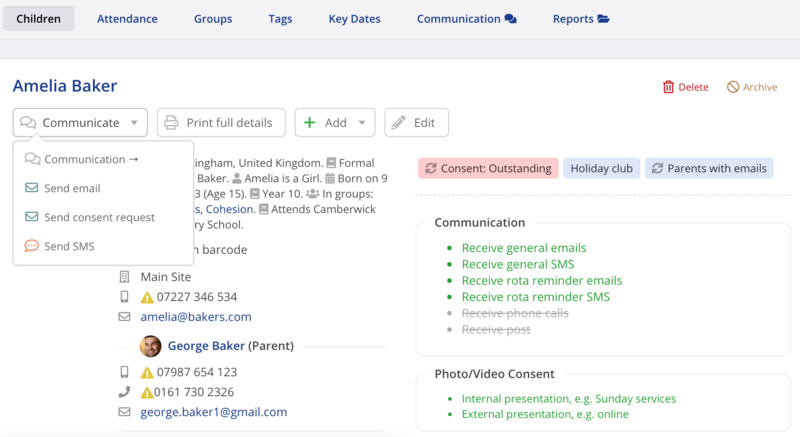 In each of the above contexts, and from most Children reports, selecting Communication from a Communicate button menu will open the Children module's Communication utility page and populate it with all the children shown on the sending page or report. The Communication utility page (shown below) can also be used to custom-select one or more children to communicate with. You can optionally filter the children further before selecting what you want to do with them - perhaps to produce Labels/Envelopes, send an Email or SMS, or export to a CSV format file. When using the Communication utility, notice how you can select individual children from the list, or select all children - selected children move from the list on the left to the box on the right. Selected children can be removed. The Search by name/tag/group can be used to quickly locate contacts within large lists - click the ? in the search box to see a full list of short cut commands available - for example, to search by tag, type tag: and all your tags will be listed - selecting a tag will select all the children in that tag; to search by group, type group: and all your groups will be listed - selecting a group will select all children in that group. Note also the drop-down selector to toggle between viewing a list of children, groups and tags. In this way you can use the tick and cross tag options to match across multiple tags, matching "Any" or "All" selected tags - remember to click "Apply tags" to select the matching children in those tags. 6. Many Children reports include a Communicate button menu. Where children are listed in the report results you'll have the option to communicate with the matching children/parents being reported, or you can "push" the list of viewed children through to the Communication utility for further communication or export options. Note also that you can send the report being viewed by email to a recipient of your choice (the recipient must be in your Address Book). Sent communications are logged in the Recent Activity > Communication section at the end of each child's profile page - parent communications are logged against the linked parent in the Address Book, unlinked parent and additional contact communications are logged against the child. Clicking "+More" will open the sent communication in preview, show details of other recipients included in the distribution, and show open rate tracking (emails only). The Communication report in the Children module reports (see below) provides a filterable report of all child communications within a given date range, providing details of the User who sent the communication, the method, the date and time it was sent or scheduled. Clicking "+More" will open the sent communication in preview, show details of other recipients included in the distribution, and show open rate tracking (emails only). For emails, there is a "Forward email" option that allows you to re-send a previously sent email (perhaps to re-send to different recipients), and the option to cancel a scheduled email that has not yet been released from the queue. The Attendance module is where you can track metrics for attendance, perhaps for your weekend services. Within the Attendance module, menu options include Dates, Categories and Reports. As this module is primarily about metrics rather than contacts, there is very little communication functionality, except within Reports where some reports can be sent to an Address Book contact. However, if you have the Service attendance record feature enabled in the Attendance module settings, this module can be used to take an attendance record at your weekend services. It is then possible to communicate with Address Book contacts (not children) based on their attendance on a particular date. A Communication menu is added within the module when this optional feature is enabled. Note: The attendance record feature in this module can only be used for adult contacts - children attendance is recorded separately in the Children module using the children's group attendance functionality or the child check-in system in Connect. 1. From the Dates menu, navigating to and selecting any service data for a particular date, you can use the "Communicate" button menu to communicate with Address Book contacts recorded as attending on that date. 2. From the Communication utility page within the Attendance module you can communicate with contacts based on their attendance at "all services" (dates) or individual services (dates). 3. Some Attendance module Reports include a "Send Report" option, allowing you to email the report to an Address Book contact. Additionally, the Attendance Averages report in the Attendance module reports has a Communicate button menu so that you can communicate with contacts grouped by average attendance over a defined date range. All communication sent from within the Attendance module is logged in the Recent Activity > Communication log on the profile page of the respective contacts in your Address Book, and in the Address Book module's Communication report. 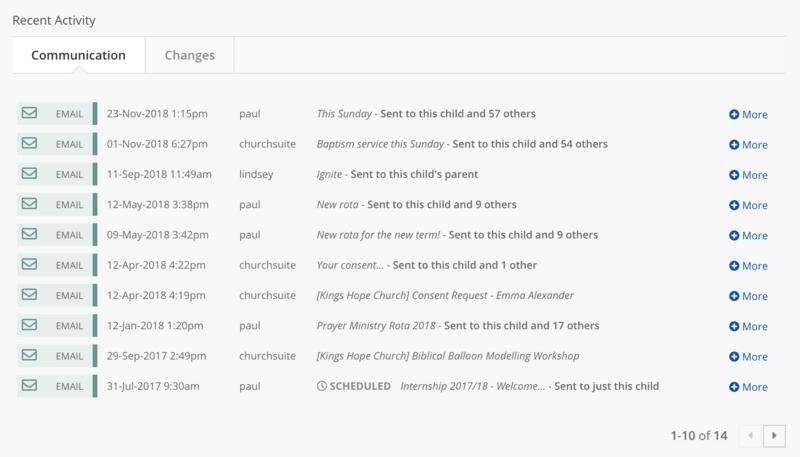 The Calendar module is used for managing your church's events rather than people, and therefore doesn't have its own Communication menu. Most Reports in the Calendar module have a Send report option enabling you to email a particular report to one or more contacts in your Address Book if you wish. 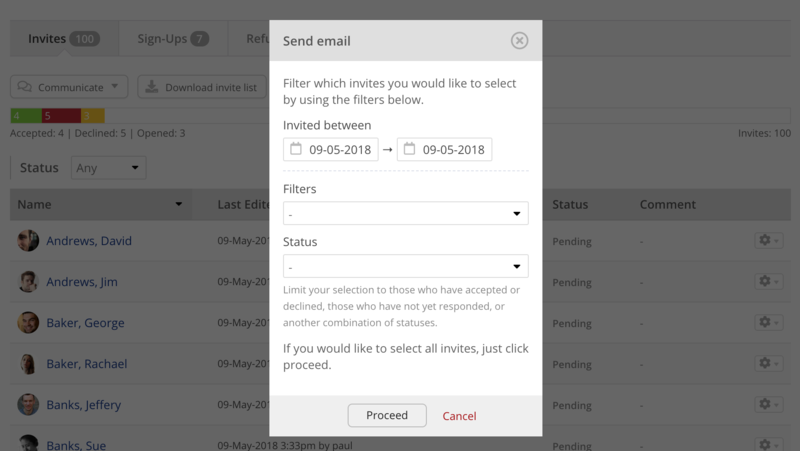 For any event where invites are sent, where sign-up is enabled or event check-in has been used, there is people-facing communication functionality provided on the event's page in the module, so that you can communicate with those sign-ups and check-ins on an event-by-event basis. 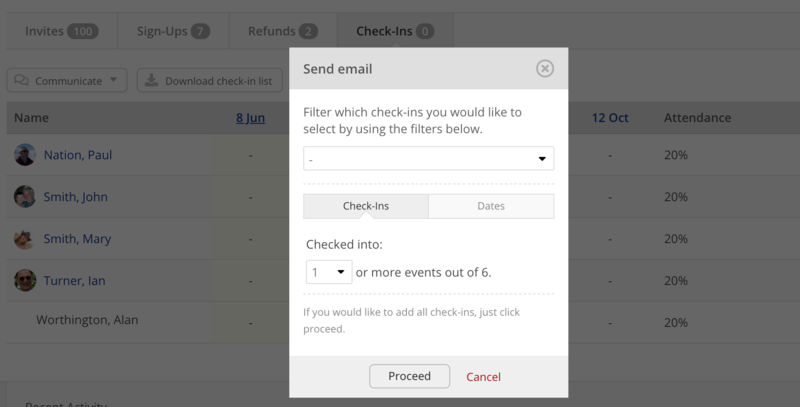 Similarly, on the event Check-Ins tab on an event page (only visible where there is at least one check-in), the Communicate button menu can be used to communicate with all event check-ins, or you can filter those in your ChurchSuite database (or not). All Calendar module communications to invitees, sign-ups, refunds and check-ins are recorded against the event's communication log in the Recent activity > Communication section at the end of the event page; and for contacts or children in your ChurchSuite database, they're recorded in the communication log on their profile page in the "Recent activity" > "Communication: section. Note that sign-up confirmation emails and overseer notification emails are not logged. The Small Groups module is the core repository for your small groups (house groups, cell group, life groups, connect groups etc). Within the Small Groups module, menu options include Groups, Attendance, Roles, Tags, Clusters (module option), Communication and Reports. 1. From the Groups menu within the Small Groups module, you can communicate with all group members directly from the group's page - simply select from the Communicate button menu at the top of the group page. Note also (above) the Send flyer option, which can be useful for sending a promotional flyer for one or more small groups in an email to prospective group members. 2. In the above method, and from most Small Groups reports, selecting Communication from a Communicate button menu will open the Small Groups module's Communication utility page and populate it with all the group members shown on the sending page or report. The Communication utility page (shown below) can also be used to custom-select one or more groups, clusters or group tags to communicate with, and whether you wish to communicate with all group members in the selection, or just members who have certain roles within the selected groups. You can then select what you want to do with them - perhaps to produce Labels/Envelopes, send an SMS or Email, export to a CSV format file, or to bulk-send My ChurchSuite emails. Notice the drop-down list to switch between communicating with Groups, Clusters or group Tags. ...and finally, how you want to communicate. It's sometimes helpful to be able to communicate with people who are no longer active in their role - perhaps a past small group leader; or perhaps, having set up your small groups for the next term, you want to communicate with those future group leaders. Therefore, in addition to the method outlined in the previous section (where you can select to communicate with active group members or those in an active role), you can also communicate with group members in archived, active and future roles directly from the Roles page. From "Small Groups" > "Roles" select a role e.g. Leader, select the Group Status between Archived, Active or Future and click Update to apply the selection. You can then use the "Communicate" button at the top of the page to send and email or SMS. 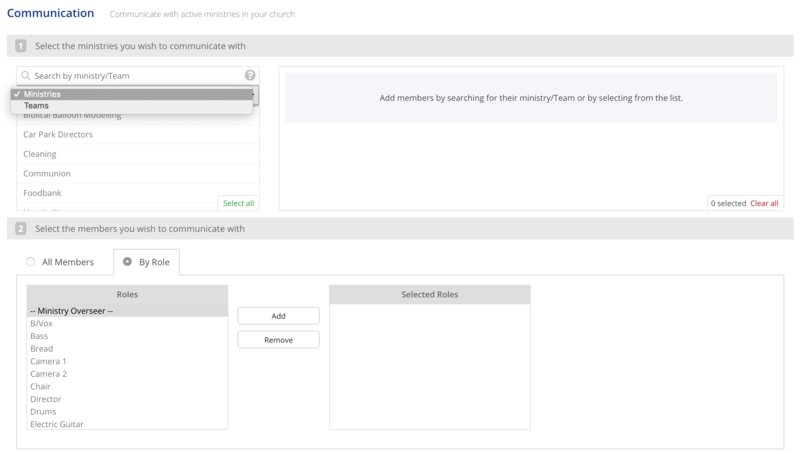 Clusters is an optional feature to help churches provide small group oversight for "groupings" of groups, and must be enabled in the module settings in order for the Clusters menu to be visible within the Small Groups module. To communicate with clusters go to to the Communication utility page in the Small Groups module ("Small Groups" > "Communication"). In the section titled Select the groups you wish to communicate with, select to communicate by Clusters and select one or more clusters to communicate with. Scroll down to the next section titled Select the members you wish to communicate with, and switch from communicating with All Members (i.e. all group members in the selected clusters) to By Role (i.e. just those members who have the selected role(s). Again, use the Add/Remove button to select or deselect roles as required - note the role of "--Cluster Overseer--". Finally, scroll to the final section Choose what you want to do with them and select between the communication types available e.g. produce Labels/Envelopes, Send an Email or SMS, export to a CSV format file, or send My ChurchSuite emails. You can easily create groupings of small groups using group Tags. Group tags can then be used to filter lists of groups based on tags. To communicate with groups within group tags go to to the Communication utility page in the Small Groups module ("Small Groups" > "Communication"). In the first section titled Select the groups you wish to communicate with, select to communicate by Tags and select one or more tags to communicate with. As with Groups and Clusters, scroll down to the next section Select the members you wish to communicate with, and switch between communicating with All Members (i.e. all group members in the selected clusters) or By Role (i.e. just those members who have the selected role(s). Again, use the Add/Remove button to select or deselect roles as required. 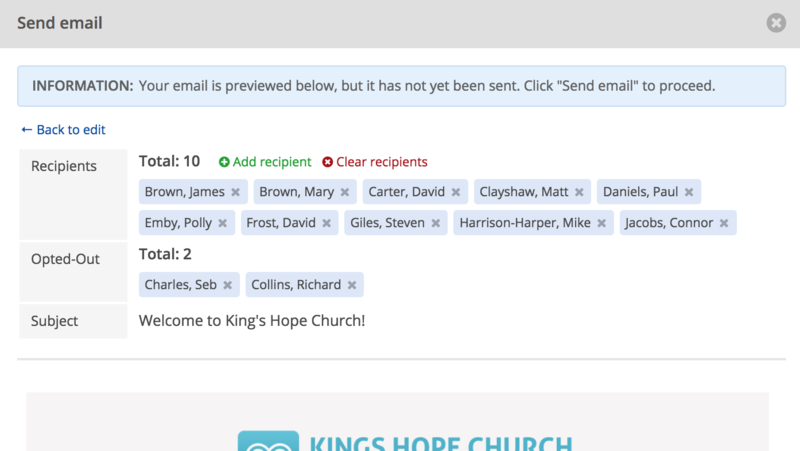 Included in the My Groups section of My ChurchSuite is a really useful Group Email feature that allows small group members to easily communicate with all the other members of their group - ideal for circulating prayer requests and changes of meeting venue. From the My Groups menu item, select any group that you are a member of - notice the Email button in the top right hand corner. 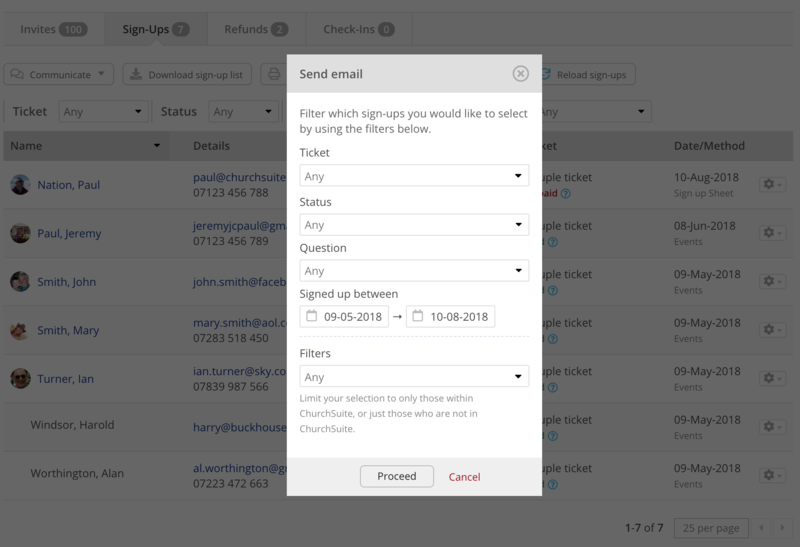 Each small group in your account has its own unique group email address assigned by ChurchSuite when the small group is first created within the Small Groups module. This email address can be used by active group members to communicate with one another - it's a closed group email, meaning that only current, active group members can use it. Anyone not in the group is unable to use the email address and will receive a bounced email message. Group emails are delivered to the personal email address of each group member and the sender and recipients can view the email in the My Communication section of My ChurchSuite, or in their preferred desktop email client. When composing a group email, authors have the option to choose whether replies go just to the author ( Just me, the default), or are copied to the author and all other group members. This is great for differentiating between prayer requests (where replies and updates could go to the whole group if you wish), and those bespoke emails where you just want replies to go to you (for example, you're having a group social and you want to know people's food choices - the whole group doesn't need to know that one of the group members doesn't like potato salad!). Currently it is not possible to send email attachments from within My ChurchSuite; although attachments can be added when emailing out from a regular desktop email client to the group email address. It is also not possible to filter emails to just particular group members or just the leaders. Group emails are closed group messages and are therefore not logged or visible within the admin-facing ChurchSuite - they are only viewable to the sender and recipient group members in their My Communications section within My ChurchSuite. Group emails are sent to all group members with an active or pending group member status. However only active and visible group members can send a group email - group members with a pending status are unable to send group emails or view the group member list until they are first activated by the group leader in My ChurchSuite or a user in ChurchSuite. Similarly, group members who have set their privacy settings such that they are not visible to the rest of the group are also unable to send group emails. The Rotas module is the core repository for your rotas and the underlying ministries and serving team members. Within the Rotas module, menu options include Rotas, Services, Ministries, Roles, Unavailability (module option), Communication and Reports. Sent communications from within the Rotas module are logged against each serving ministry or rota's members profile page in the Address Book and Children modules, and can also be viewed and reported using the Communication report in the Address Book and Children modules respectively. 1. From the Ministries menu within the Rotas module, you can communicate with all ministry members directly from a ministry page - simply select from the Communicate button menu at the top of the page. 'Sent' ministry communications are logged in the Recent Activity > Communication section at the bottom of the Ministry page, and also in the Recent Activity > Communication section at the bottom of each ministry member's profile within the Address Book or Children profile. 2. From most Rotas module reports, selecting Communication from a Communicate button menu will open the Rota module's Communication utility page (see below) and populate it with all the ministry members shown on the sending page or report. The Communication utility page (shown below) can also be used to custom-select to communicate with one or more Ministries, or Teams within a ministry. Scrolling down the Communication utility page you can then select whether you are communicating with all ministry/team members, or By Role. And then finally, you can then select what you want to do with them - perhaps to produce Labels/Envelopes, send an SMS or Email, export to a CSV format file, or to bulk-send My ChurchSuite emails. While Ministries are the core repository for your regular serving team members for each ministry, the actual rotas for those ministries may well include additional ad hoc volunteers who are not ministry members, but have been added to a rota to fill a gap/need, cover an absence or boost a team for a particular date on the rota. It's therefore sometimes helpful to communicate with rota members so that ad hoc volunteers are included in your communications e.g. when sending out the rota. From the Rotas menu within the Rotas module, you can communicate with all rota members directly from a rota page - simply select from the Communicate button menu at the top of the page. From here you can send an email or SMS, or use the Send rota option to include the rota in the body content of the email. Sent communications are logged in the Recent Activity > Communication log at the bottom of the rota page, and also in the Recent Activity > Communication section at the bottom of each rota member's profile within the Address Book or Children profile. Rotas can be grouped together for a Service. It's easy to communicate with all rota members for a service, perhaps to let them all know about an important last minute change to an upcoming service that may affect people from a range of rotas. From the Services menu within the Rotas module, you can communicate with all service members directly from a service page - simply select from the Communicate button menu at the top of the page. It's sometimes helpful to be able to communicate with serving ministry members based on their role - perhaps to reach out to all your worship leaders for their availability for an upcoming event. Therefore, in addition to the method outlined above using the Communication utility page in the Rotas module, you can also communicate with ministry members in certain roles directly from the Role page. From "Rotas" > "Roles" select a role e.g. Worship Leader, and then click the Communicate button at the top of the role page to send an email or SMS to all ministry members in that role. If you wish to communicate with ministry overseers, use the Communication utility page to select your Ministries or Teams and By Role > "--Ministry Overseer--". 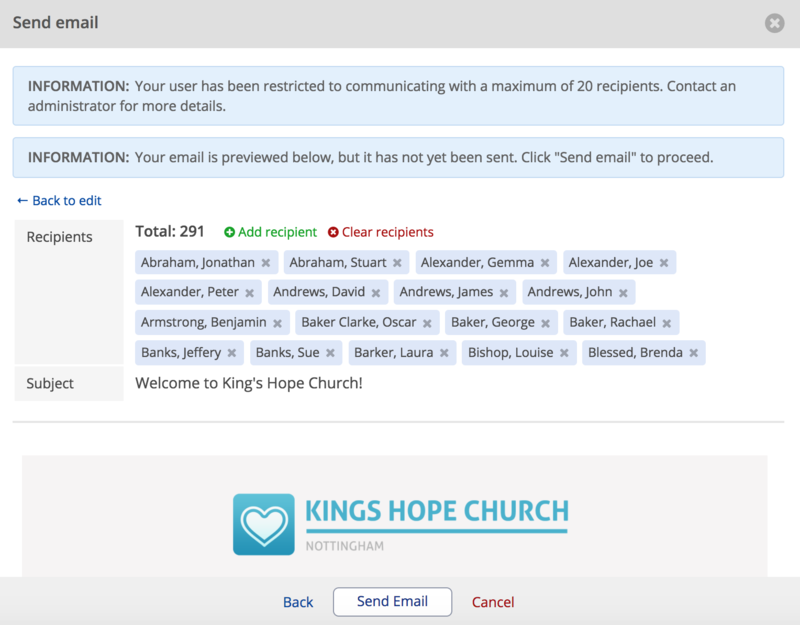 Included in the My Rotas section of My ChurchSuite is a really Group Email useful feature that allows rota members to easily communicate with all the other members of their rota - ideal for circulating prayer requests, rota swap requests and passing on important information to fellow serving team members. From the My Rotas menu item, select any rota that you are a member of. Notice the "Email Rota" button in the top right hand corner. 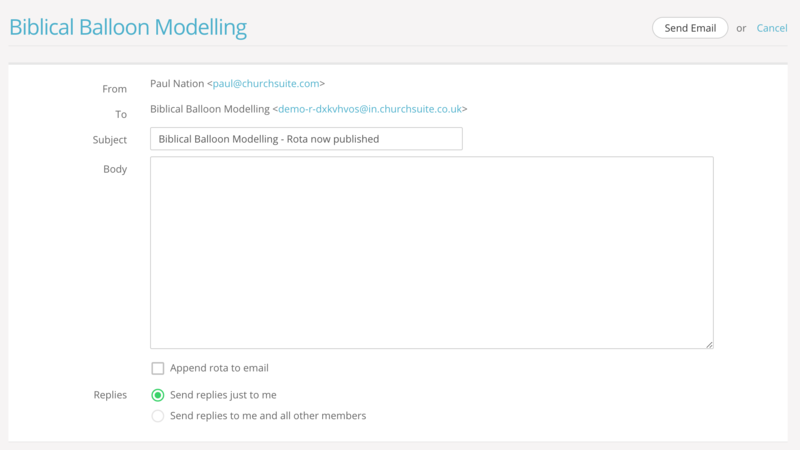 Each rota in your account has its own unique rota group email address assigned by ChurchSuite when the rota is created within the Rotas module. This email address can be used by members of the rota to communicate with one another - it's a closed group email, meaning that only current, active rota members can use it. Anyone not in the rota group is unable to use that email address and will receive a bounced email message. Rota group emails are delivered to the personal email address of each rota member and the sender and recipients can view the email in the My Communication section of My ChurchSuite, or in their preferred desktop email client. When composing a rota email, authors have the option to choose whether replies go just to the author (the default), or are copied to all other rota members. This is great for differentiating between prayer requests (where replies and updates may go to the whole group), and those bespoke emails like swap requests where you just want replies to go to you, the sender. Currently it is not possible to send email attachments from within My ChurchSuite; although attachments can be added when emailing out from a regular desktop email client to the rota group email address. It is also not currently possible to filter emails to just particular rota members, holders of certain roles, those in particular teams or those serving on a particular date. Ministry overseers have the identical rota group email as outlined above, except with the additional option of being able to include the rota in the email. Rota group emails are closed group messages and are therefore not logged or visible within the admin-facing ChurchSuite. They are only viewable to the sender and recipient rota members in their My Communications section within My ChurchSuite. The Giving module is the core repository for your givers. Within the Giving module, menu options include Givers, Donations, Batches, Claims (UK only), Funds, Tags, Communication and Reports. Givers may be linked to an Address Book contact, or be unlinked givers who only exist as givers in your Giving module. For confidentiality, all communication with givers (linked and unlinked) is maintained in logs in the giver's profile page (not in the Address Book). 1. From the Givers menu, you can communicate with any giver directly from their giver profile page - simply select to send an email or SMS, or to send a statement of their donations. 2. You can communicate with all the givers assigned to a particular Giver Tag. Giver Tags allow you to create custom groupings of givers that exist within your Giving module only. For example, you might group together all the Building Project givers into a "Building Project Giver" tag. 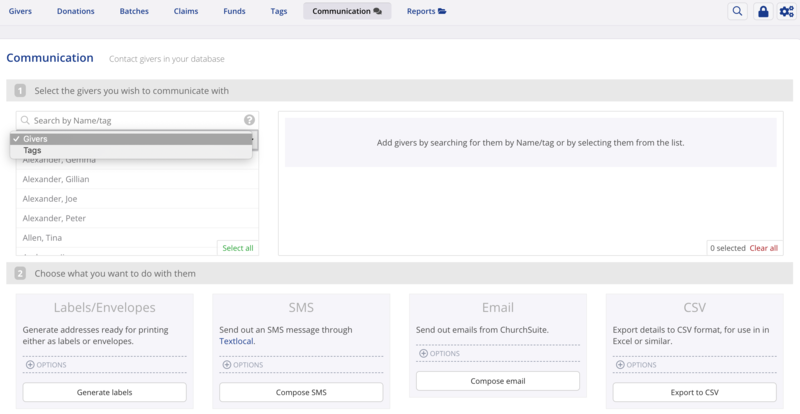 To communicate with all givers in a tag, navigate from the Tags menu in the Giving module, select a Tag, and then use the Communicate button menu at the top of the page. 3. 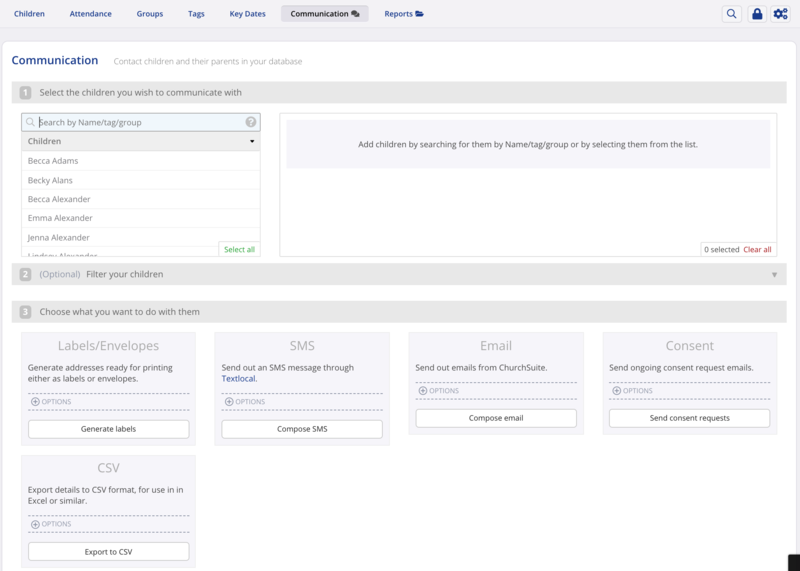 In the above Tags context, and from most Giving module reports, selecting Communication from a Communicate button menu will open the Giving module's Communication utility page and populate it with all the givers shown on the sending page or report. The Communication utility page (shown below) can also be used to custom-select one or more givers to communicate with. Having selected which givers you want to communicate with, you then select what you want to do with them - perhaps to produce Labels/Envelopes, send an Email or SMS, or export to a CSV format file. When using the Communications utility, notice how you can select individual givers from the list, or select all givers - selected givers move from the list on the left to the box on the right. Selected givers can be removed too. The Search by name/tag can be used to quickly locate givers within a long list - click the ? in the search box to see a full list of short cut commands available - for example, to search by tag, type tag: and all your giver tags will be listed - selecting a tag will select all the givers in that tag. Note also the drop-down selector to switch between viewing a list of Givers and Tags. In this way you can use the tick and cross tag options to match across multiple tags, matching "Any" or "All" selected tags - remember to click Apply tags to select the matching givers in those tags. 4. Many Giving module reports include a "Communicate" button menu. Where givers are listed in the report results you'll have the option to communicate with the matching givers being reported, or you can "push" the list of viewed givers through to the Communication utility page for further communication or export options. Note also that you can send the report being viewed by email to a recipient of your choice (the recipient must be in your Address Book). Sent communications are logged in the Recent Activity > Communication section at the end of each giver's profile page. Clicking "+More" will open the sent communication in preview, show details of other recipients included in the distribution, and show open rate tracking (emails only). The Communication report in the Giving module reports (see below) provides a filterable report of all Giving module communications within a given date range, providing details of the User who sent the communication, the method, the date and time it was sent or scheduled. Clicking "+More" will open the sent communication in preview, show details of other recipients included in the distribution, and show open rate tracking (emails only). The Bookings module is the core repository for your resource bookings and customers. Within the Bookings module, menu options include Planner, Bookings, Customers, Resources, Types, Communication and Reports. Navigating to any booking within the module, you can click to communicate with the booking customer (or the Address Book contact assigned to the booking) from the booking page. From the Communicate button menu you can send and email or SMS, or email the booking confirmation. From a Customers menu in the Bookings module, you can click to communicate with a booking customer. 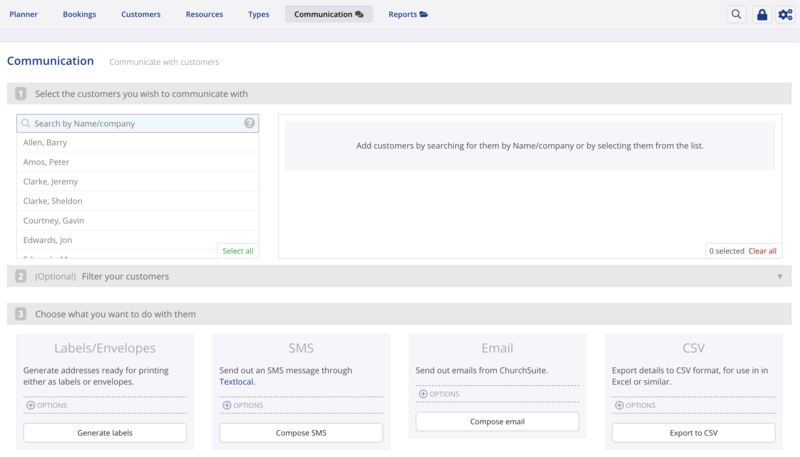 Use the Communicate button menu at the top of the customer page to send an email or SMS. 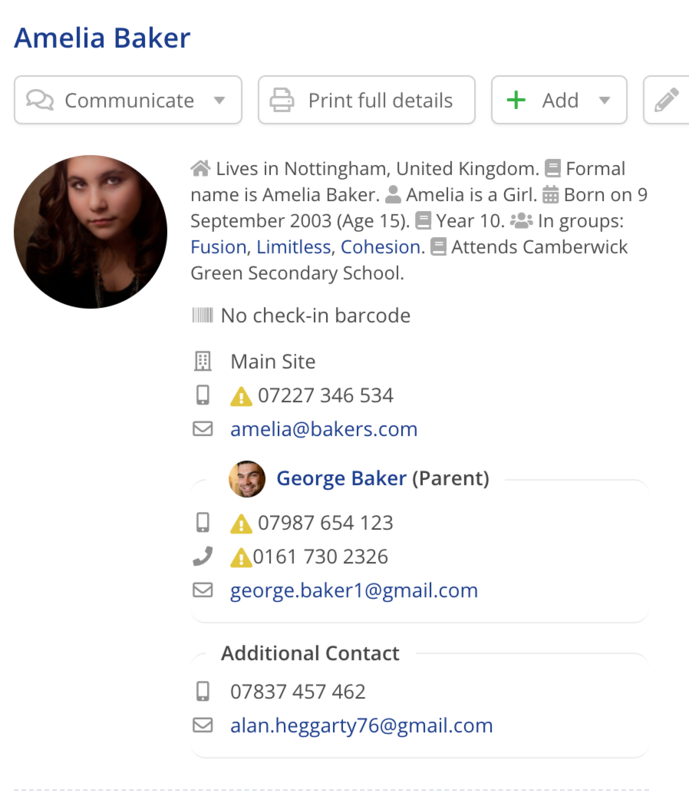 And finally, from the Communication utility page in the Bookings module you can custom-select one or more customers to communicate with, before selecting what you want to do with them - perhaps to produce Labels/Envelopes, send an Email or SMS, export to a CSV format file. 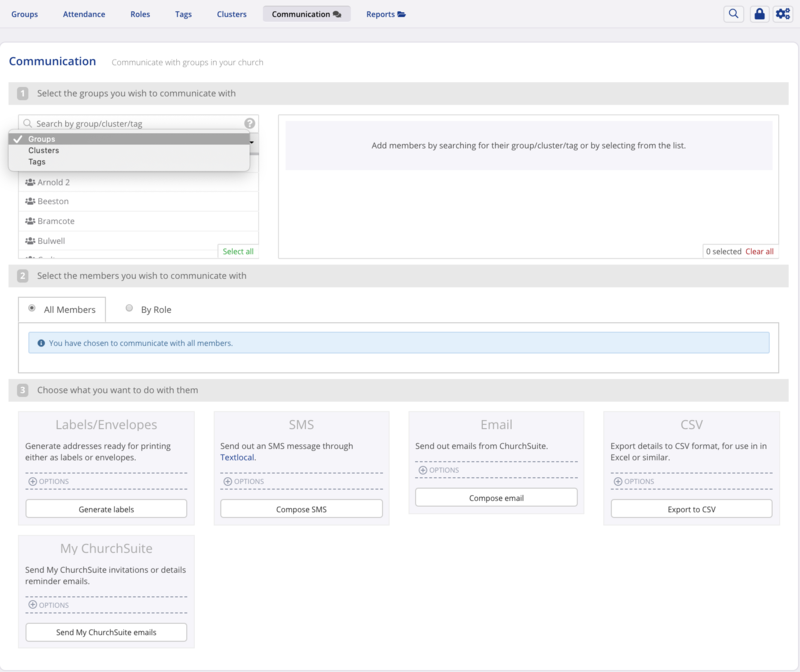 When using the Communication utility, notice how you can select individual customers from the list, or select all customers - selected customers move from the list on the left to the box on the right. Selected customers can also be removed. The Search by name/company can be used to quickly locate customers or companies within long lists - click the ? in the search box to see a full list of short cut commands available - for example, to search by company, type company: and all your companies will be listed - selecting a company will select all the customers in that company. 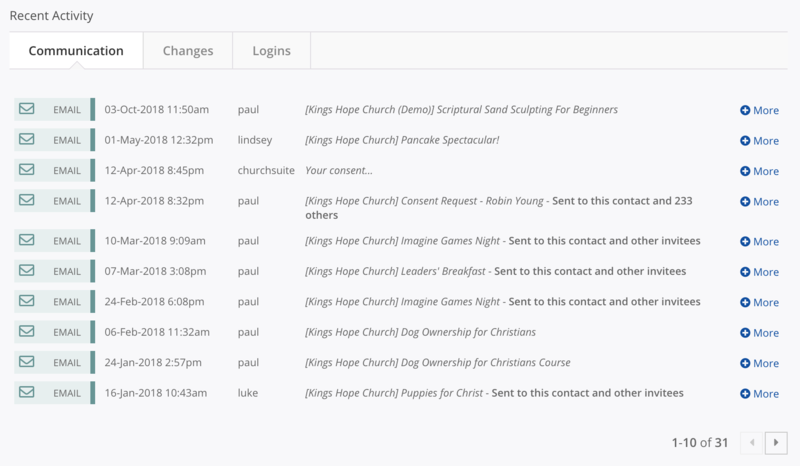 Your admin-facing system includes the ability to track when an email you've sent through ChurchSuite has been opened. When sending emails it's often helpful to know that your message has been received and sometimes it's beneficial to know if a specific recipient has seen your message. 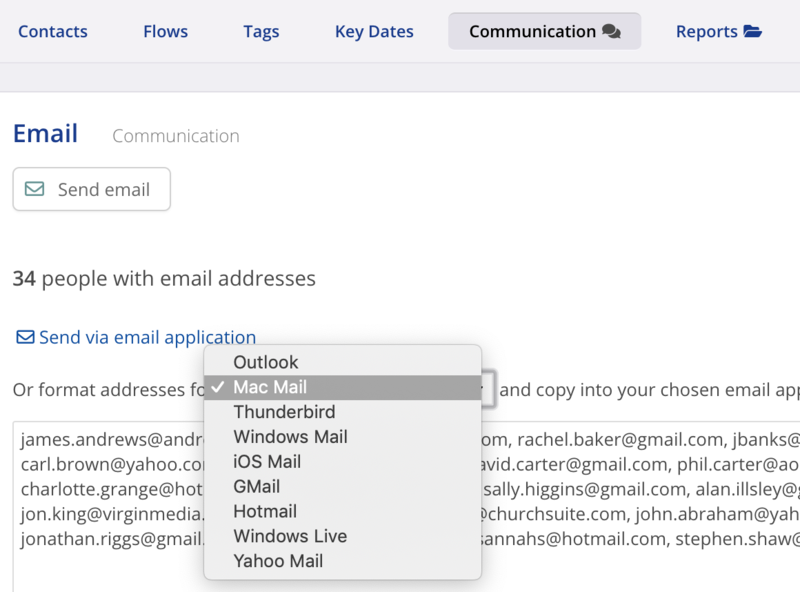 With email open tracking, you can see both an overview of the open rate percentage and, by clicking on the open rate percentage, you're the able to see which recipients have opened the email and when. Please note that not all email clients support open tracking - email clients (e.g. Outlook, Hotmail) that have images in emails disabled by default can't be tracked. Where ChurchSuite hasn't been able to track an email as being opened, it will be listed as "Unknown", although it may in fact have been opened! You should therefore take you open rates as a broad indicator, rather than use them to determine that people are not opening your emails! 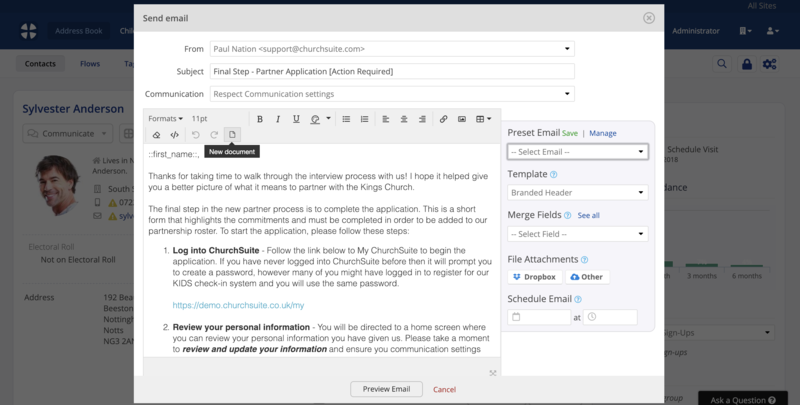 Clicking on any email address on a person's profile within ChurchSuite will open your default email application on your device and populate a new email message with the recipient's email address. From there you can take advantage of any formatting or styling options included in your email application. Please note that recipient email addresses are populated in the "To" field and are not 'Blind Copied" by default in the same way they are in ChurchSuite communications. If you are emailing multiple recipients in the same message, you may prefer to copy and paste the addresses from the "To" field into the "Bcc field" to maintain privacy. Ordinarily when you use ChurchSuite's communication functionality to send an email, you choose your distribution list (perhaps from a Tag or from a report) and then the ChurchSuite "Send email" editor is displayed (see example below). As an alternative to using this editor, click Cancel. 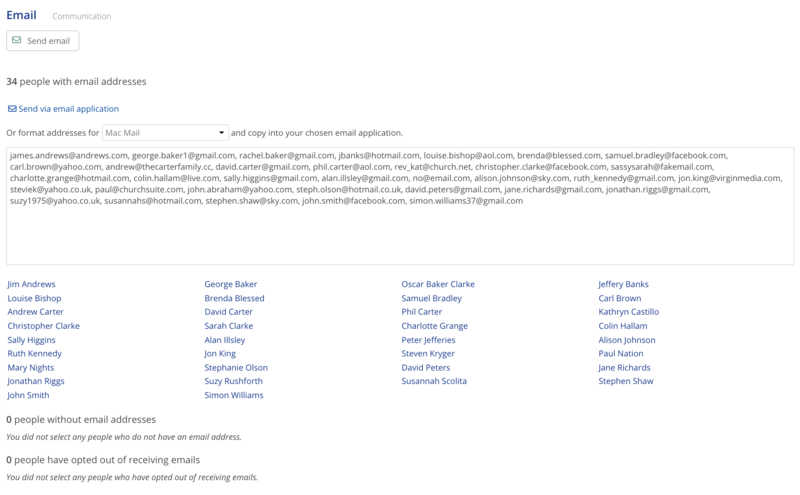 Your screen now shows the email distribution list you had selected. Note the Send via email application button and the drop-down menu option to Format for. Here you can select from a choice of popular desktop email clients. Clicking Send via email application will open the default email application for your device and populate the email distribution list into the "To" field of a new blank email (formatted based on the "format for" selection made). Make sure you select the correct format so that your addresses will always pull through to your email application correctly and with the required formatting. Please note that recipient email addresses are populated in the "To" field of your email client; they and are not 'Blind Copied" as they would be in ChurchSuite's comms functionality. If you are emailing multiple recipients in the same message, we recommend that you copy and paste the email addresses from the "To" field into the "Bcc" field in order to maintain privacy when sending your email message. Please note that communications made through either of the above two methods, using an external email application, will not be recorded within ChurchSuite's communication logs, reports or with a member's My ChurchSuite communication history. 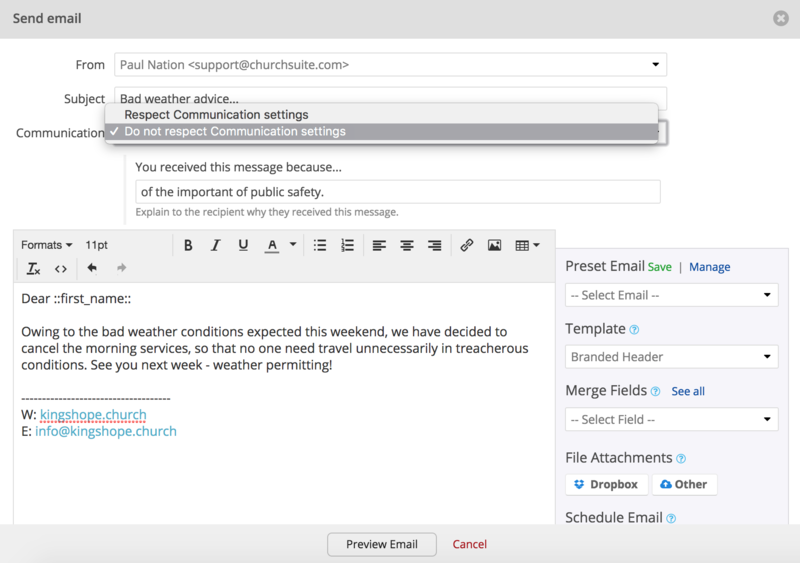 If you wish to make use of ChurchSuite's comms logging functionality, you would need to use ChurchSuite's "Send email" Editor. You can read further support articles that explain how to stylise and personalise your church's emails to fit in with all your other church styling.